I will admit I found Sparks late in the game. For a long time I knew them primarily through other artists covering their songs: Martin L Gore doing 'Never turn your back on Mother Earth' (originally from Propaganda) and Siouxsie & The Banshees doing 'This town ain't big enough for both of us' (originally from Kimono My House.) Then 'When do I get to sing "My way"' (with Sparks actually singing it) made it onto the rotation at an alternative club I used to frequent, and I thought, well, I really should know more about Sparks. It didn't take long to rediscover a track I'd heard way back when it had barely missed the Top 40 in 1983. I had completely forgotten the zany 'Cool places' featuring Jane Wiedlin. Zany is a good word to describe Sparks, though it doesn't tell the whole story. 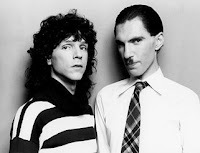 Comprised primarily of brothers Ron and Russell Mael, Sparks formed way back in 1970, and proceeded to release an incredible fourteen albums in their first fourteen years, finding more success in the UK and Europe than in the United States. While their sound has fluidly evolved, their irreverence and wit are constant. They've regularly demonstrated how keenly they understand the popular music landscape and they've fashioned songs that give an original perspective on musical trends. The year before 'Cool places', Sparks released Angst In My Pants, with the single 'I predict'. Propelled as much by the guitar as the percussion, the song launches immediately into a list of predictions that sound like tabloid-style fabrications, or are just plain absurd: 'They're gonna find the Queen is a man / but they really won't care - I predict / Lassie will prove that Elvis and her / had a fleeting affair - I predict'. The list is punctuated by reassurance: 'Are my sources correct? / Yes I know they're correct'. The tone and theme of the song is brilliant irony - fervently believing that to say something loudly and often enough is to make it true, regardless of proof. 'Cold beer will cure a cold / Cold beer and pretzels takes care of cancer'. As listeners we have two choices: reject the song outright, or join the charade. If the assertions are questioned, the song falls to pieces; but it's so infectious that we are willingly complicit, and experience the irony almost viscerally as we sing along 'They're gonna stop Saturday night / so you better have fun NOW - I predict'. The ne plus ultra is the outro with its final prediction, one of the few that has a chance of coming true: 'This song will fade out' repeated at least a dozen times. And then, as if to cement any lingering doubt - the song stops dead at the end of a measure. Rather than Alanis Morissette's piquant but misleading 'Ironic', 'I predict' is the rightful poster child of irony in the pop music canon. The arrangement further establishes the song as an important if under-appreciated gem. The crunchy guitars make an explicit connection between the hard rock and glam guitars before them and the pop new wave guitars (and even some of the synths) that would follow. The syncopation recalls dancier post-punk, and tweaks it in a way that anticipates the more recent 'dance-punk' and 'electro' movements. And the sung but tuneless doubled vocal is right at home in seventies arena rock but demonstrates its effectiveness for alternative acts of all stripes. 'I predict' sits in that incredibly fertile territory among classic/seventies anthems, glam, new wave and electro, epitomizing the cross-pollination that went on in those last years of the seventies and first years of the eighties, when pop music seemed to soak up influence from almost any genre. It's why 'I predict' doesn't sound like it's 25 years old, nor does it sound like it's new. It's doing its own thing on its own terms, and deserves respect for that savvy.